In June 2007, the theme of our Founders Day celebration will be the 150th anniversary of the Foxboro common. purposes: The names of those who served our nation and town are remembered in beautifully lit memorials. The bandstand, built by the Foxboro Jaycees, displays the Nativity scene at Christmas, concerts throughout the summer, and occasional Ecumenical services. The common hosts yard sales, Senior Center picnics, Easter egg hunts, memorials and remembrances, ceremonies, and countless other community events. Two friends of mine were even married on Foxboro common. The elegant information signs on both sides of the common keep us updated and informed about community events, elections, and more. The hand crafted “FOXBOROUGH” signs welcome you home. The lanterns light the way with classic style. The American flag flies proudly at the center. Yellow ribbons adorn the lamp posts and remind us of our neighbors in the military who serve us so well. 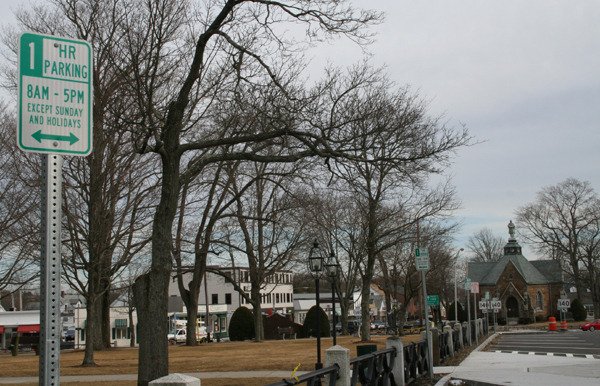 The Foxboro common is the nexus of our town. As elections near, you’ll see a sea of placards endorsing candidates and folks waving at cars. Often, high school kids wave posters advertising their charity car wash. At any time of day, people are walking through it. When the weather is good, residents flock to the common to enjoy the trees, the grass, the breeze, and just take a breather. High school kids often hang out on the common. In autumn, the trees explode in orange and red beauty. 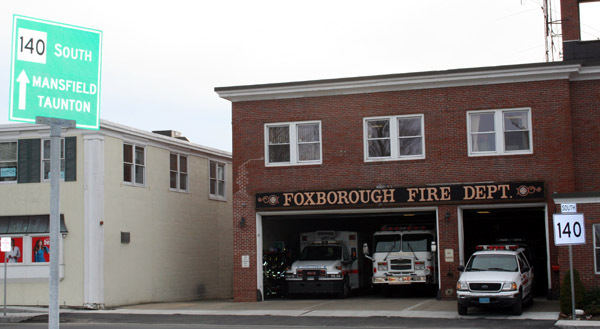 Foxboro common is one of the gems of our town, an oasis of nature amid the concrete and a gathering place and social center, and we treasure it for its history, splendor, and functionality. As we commemorate the common’s 150th anniversary, plans are already afoot to fix up the bandstand, repaint the flagpole and much more. The project to illuminate the memorials was completed last year and our sincere thanks go out to everyone involved with this important milestone. And finally, after a seemingly endless, years-long ordeal, the street construction around Foxboro common is complete. You’d think we’d be ecstatic. I for one am not. I’m talking about the new blitz of traffic signs, and I am not making a joke. When construction was completed, the powers that be decided to literally plaster the streets around the common with signs. Admittedly, some changes are necessary. For example, after the tragic accident that claimed the life of a young man on Foxboro common a few years ago, placing a blinking yellow light at the top of the common at the time was prudent. But without being flip, was there a sale on “Route 140” and “1 Hour parking” signs? Until a few days ago there were FIVE signposts indicating the way to Route 140 in front of the Memorial Hall (now there are FOUR). Former Reporter editor Mark Flanigan computed that there is one “1 Hour parking” sign for every two and a half spaces around the common. There is no need for this insane number of signs and markers. Look anywhere and you will see three, four and even five of these signs in your field of vision. Calling this number of road signs overkill is simply an understatement. Just how stupid are we supposed to be that we need over one hundred “1 Hour parking” signs and double “Route 140” signs and FIVE route 140 signs at the bottom of the common in front of Memorial Hall? Did you miss the Route 140 sign on the left side of the road? No problem. You’ll find a new one directly across from it, on the right, or vice versa. There are now TWO route 140 south signs next to the fire station. Again, was there a sign sale? Are ALL the new STOP signs necessary? Are they for safety? And the double DO NOT ENTER signs posted everywhere hardly compliment the multiple “ONE WAY” signs next to them. How many are necessary? If you live here you know the common is a rotary. If you’re from out of town, well, how many signs are enough? If memory serves, there were two incidents of drivers going the wrong way around the common. Also, if memory serves, both were DWI. So how many signs would have stopped them? (Answer: None). To the not drunk drivers? One prominent sign would be fine. What can be done? I have a suspicion that just cutting them down probably violates some law somewhere. The people of this town certainly didn’t ask for this jungle of repellent metal to surround our common — there wasn’t any vote. 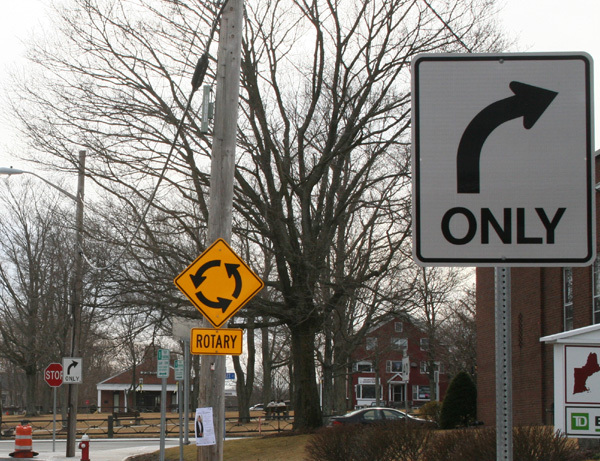 There wasn’t a selectmen’s conference that presented compelling evidence that the way to Route 140 was so confusing that we had to quadruple the number of signs to it. There was no town meeting to discus s it. There has to be a reasonable compromise — SOME signs are needed. The vast majority of redundant signage is not. The common is all about balance. Nature amid the concrete. There HAS to be a balance between safety and directions versus the offensive number of signs posted. Progress is one thing. Signage for safety reasons is one thing. But this is just redundant and ugly and spoiling our scenic common. That is wrong. Come Founders Day, as we celebrate that beautiful part of our town and its 150th anniversary, and all it means to us, will all the pictures of the floats and bands and marchers be blocked by dozens of parking signs and directions to Route 140? Or can something be done? Speak up! Call our town officials and representatives. Write letters. Demand that our common be restored and these ugly signs are removed.